French and Canadian scientists make discovery that could affect diagnosis, genetic counselling and therapeutic approaches in patients with a rare conditionMontreal – Rare hereditary recessive diseases were thought to be expressed in off-spring only when both parents carry a mutation in the causal gene, but a new study is changing this paradigm. 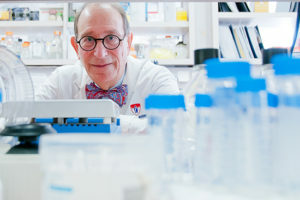 An international research team led by scientists at the University of Lorraine in France along with McGill University and the Research Institute of the McGill University Health Centre (RI-MUHC) in Canada discovered a new cause of a rare condition known as cblC, that they named “epi-cblC”. They reported it in patients from Europe and the United States. Patients who have cblC are not able to process *vitamin B12, leading to severe health problems.cblC is usually caused by two mutations – one inherited from each parent – in a gene called MMACHC. In some patients, the scientists found this disease actually results from a mutation on a single copy of the gene and the silencing of the second copy by a gene modification referred to as epimutation. This epimutation is produced by a mutation in an adjacent gene. Their findings, which were published this month in Nature Communications, may have an impact on diagnosis, and genetic counselling in families with genetic diseases, as well as in the development of new therapeutic approaches. “We described a distinct and totally new mechanism referred as epi-cblC, whereby an epimutation causes abnormal regulation of the expression of an important vitamin B12 gene. This can result in a serious genetic disease that can cause anemia, neuro-cognitive impairment, and even early death,” says the study’s lead-author, Dr. Jean-Louis Guéant, director of the Inserm unit of Nutrition-Genetics-Environmental Risks at University of Lorraine and head of the Department of Molecular Medicine and Personalized Therapeutics – National Center of Inborn Errors of Metabolism at the University Regional Hospital of Nancy. “We have identified some 40 rare diseases where this mechanism can be produced at the level of similar trios of genes,” says Dr. Gueant.